This time around I am doing a double Marvel review. And as it turns out a double Claremont review. The first is an issue that my sister in-law bought for me at a garage sale, but I had seen it before enough to know exactly what it was when I saw it. The other issue is part of a series that I have heard of, but I know nothing about the series. So onto the first issue. I have seen hundreds of copies of this issue while stocking the back issue bins at my local shop, but this is the first time I have read it. But then again I don’t read a whole lot of X-Men books. So this was a great issue for me to review. It’s an okay issue, but feels pretty basic. 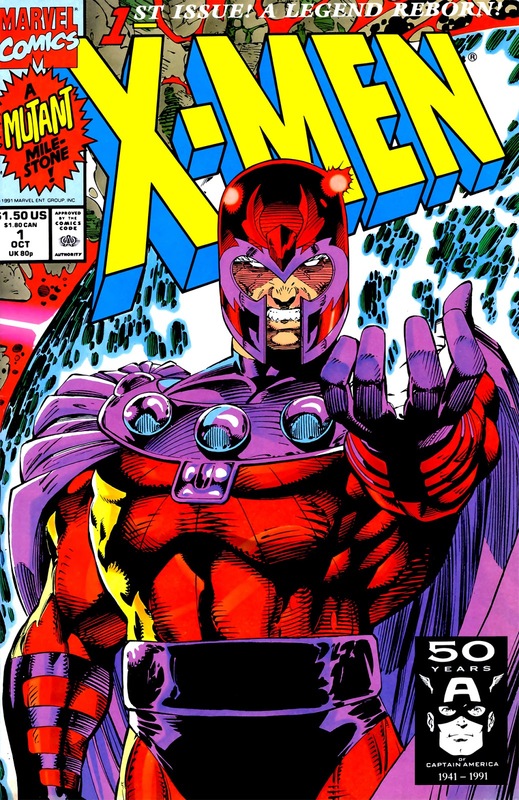 You have Magneto ruling over Asteroid M, and gives up on Earth until a small group of mutant terrorists hijack a shuttle and go looking for him to convince him to come back to Earth to help his people. Meanwhile the X-Men are training as small squads to be ready for any threat that could arise. The terrorist’s actions attract the attention of of S.H.I.E.L.D. and Nick Fury, who reaches out to the X-Men to help. Claremont does what he does best, writes good dialogue for the characters he gets to write. He also jams the panels with thought balloons and narration boxes. Unlike most people though I don’t really mind all of the narration Claremont uses. None of it comes off as annoying or unnecessary. The art is really strong. Lee delivers on a really good example or how nineties art can be beautiful. It is a bit heavy on the cross hatch shading, but it works if you consider where he comes from artistically. It’s an interesting concept for a series. Heroes from different universes come together to defend against threats to all universes. They gather at the Crystal Palace, a fortress in no specific time or space. The team is made up of Cat, an alternate reality version of Kitty Pryde. Sage, a girl from the main Marvel universe who has all of the memories of the guardian of the omniverse stuck in her head. Some of which are trying to take over. The leader of the team, Sabretooth from the Ultimate Universe it appears. Though it isn’t clear. Psylocke, the one and only. Rogue, it isn’t really clear which universe she comes from. But she is only in a small bit of this issue. Mystiq, a male version of the villain Mystique. And Morph, a shape shifter of some kind. This is the typical first issue, it introduces the characters and the world they inhabit. But it doesn’t make it totally clear what the overall story is. The beginning of the issue insinuates that the core of the problem that is threatening the universes all starts with the famous trip into space by the Fantastic Four. Though the only variance that appears to exist is that Sue is saved by Namor when the crew crashes back to Earth after their accident. Claremont paints an interesting picture in this issue. And he shows an ability to adapt his writing style to the modern era. He still uses all of the thought bubbles and narration boxes, but they don’t seem to overwhelm the panels like his earlier issues. The story, though not entirely clear, is really interesting. Grummet’s art is impressive. Each of the characters are easily recognizable from one another, and the backdrops of the world come to life beautifully. Grummet’s Panel layouts are easy to follow. The eye can naturally find where to go without getting lost. These issues were both really fun in their own ways. X-Men #1 because of the nostalgia of that era in comics. All of the markings of the 90’s made it fun to revisit. New Exiles for the interesting concept of a team of members from different universes, teaming to stop threats to all of the omniverse. As always thank you for reading my review. I hope you enjoyed hearing my thoughts on these two issues from different eras in Claremont’s career. If you have any comments or suggestions, please leave a comment on this post.